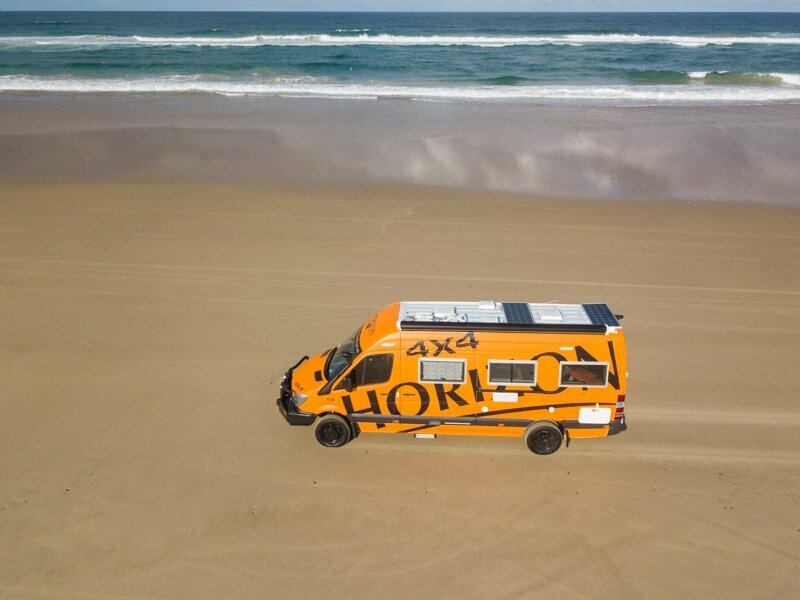 I was concerned driving such a large vehicle onto Killick Beach, north of Crescent Head. I’m no stranger to driving on beaches, or even driving on this particular one. 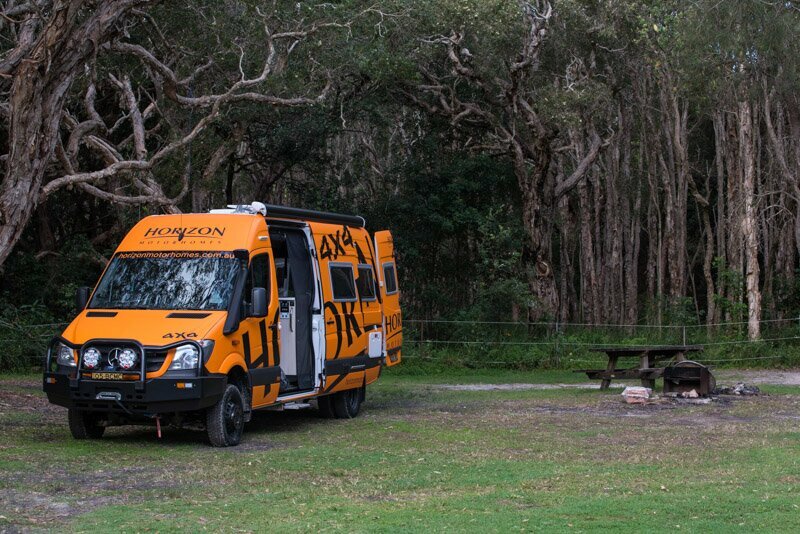 Maybe it’s the thought of taking $200,000 worth of campervan into an area that could turn it into a $10 campervan with just one unwitting mistake. I let a lot of air out of the front tyres before I did, but had trouble on the rears. As they are a double wheel and the valves are inside the rims, it wasn’t so much that I couldn’t deflate them, more that I wasn’t sure how I’d be able to pump them back up again. After a few half-hearted attempts at checking if my compressor nozzle will fit, I give up and hope I’ll be right. Surely four pumped up tyres are just as good as two deflated ones? It’s low tide so the beach is wide and, nearer the water, firm and flat, so the Horizon Waratah 4×4 glides along. In fact, I consider putting it into cruise control, just because. I can feel that I’d have been better off with a little less air in the rear, but it goes well, all the same. Through the softer sand at the northern end of the beach, the Merc’s power comes in handy. On my first attempt at the exit track I abort at the last moment, but with a bit of right boot, the motorhome pushes through the soft sand and over the dune onto the firm gravel track that leads to camp. 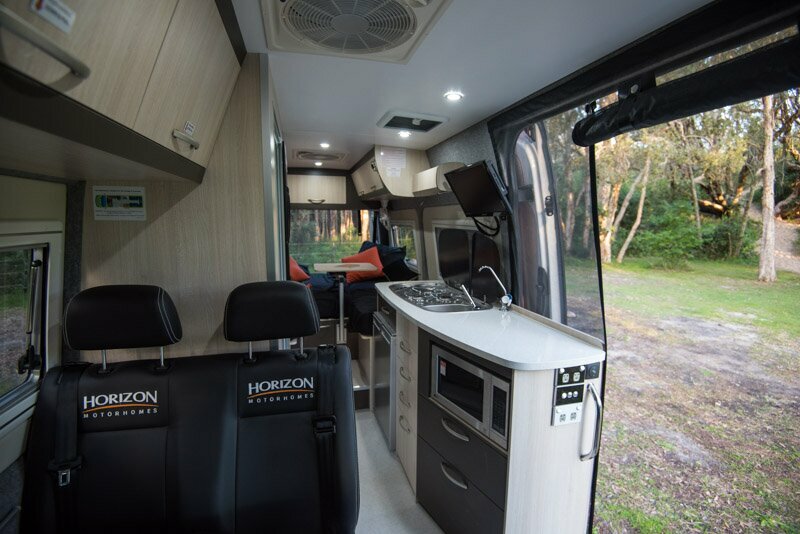 This motorhome is actually the personal vehicle of Horizon Motorhome’s owner, Clayton Kearney. 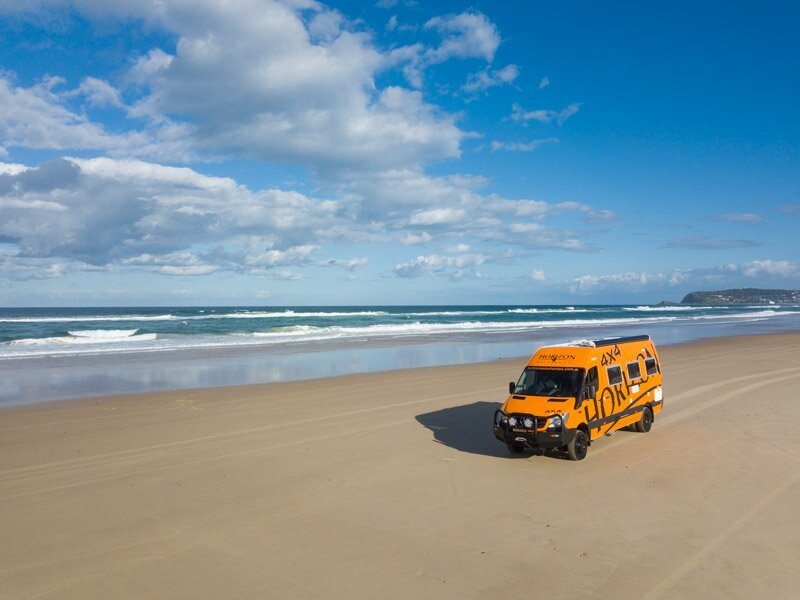 Having spent the last 23 years building motorhomes for others, he’s decided it’s time he had one all to himself – and something that’s ready to travel just about anywhere. This isn’t the first time he’s done this, either. A few years ago, he saddled up with the family in a similar vehicle and did a nearly full lap of Australia. 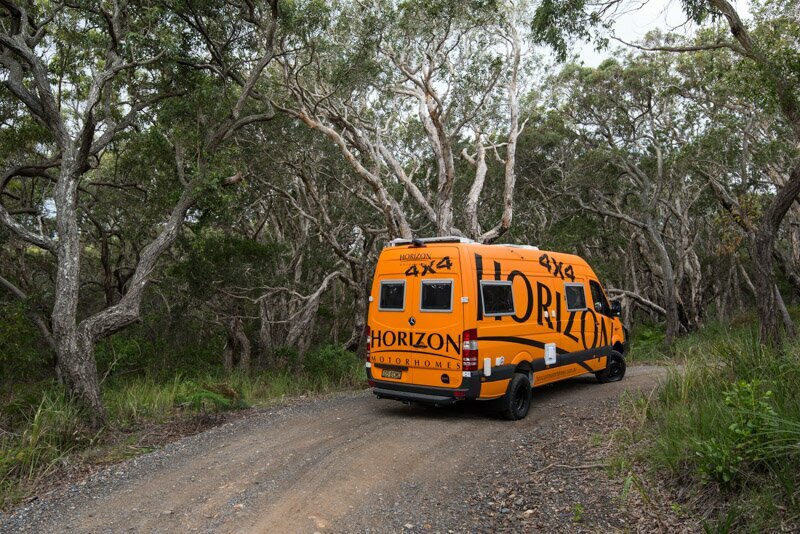 The Waratah is Horizon Motorhome’s top-of-the-line model and, when built into the 4×4 version of the Mercedes Benz Sprinter, is a genuine off-road touring vehicle. It’s got ground clearance, composure on rough roads and plenty of power and torque when it’s needed to get through a tough patch. Under the bonnet is Mercedes-Benz’s 3.0 litre turbo diesel, V6. It’s capable of 140kW and 440Nm, and is paired to a smooth-changing five-speed automatic gearbox. On the highway, it is a dream to drive, even as high off the ground as it is. Once you’re up to speed (which doesn’t take long), it’ll sit in cruise control all day if you want it to. This is still a commercial vehicle, though, so there’s a bit of engine noise, and this is still a motorhome, so there’s the occasional clink of cutlery or poorly packed gear, but very little else from the cabinets or otherwise. Love This? 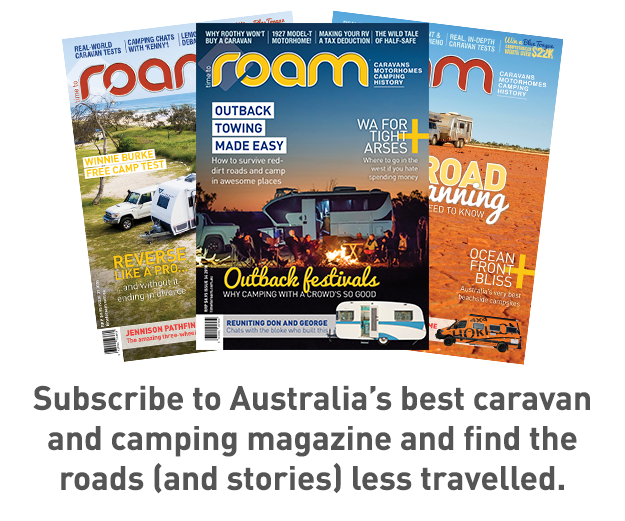 Read the rest of issue 33 of ROAM here. 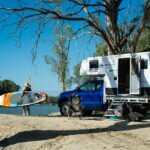 Off-road, the motorhome is just as composed, although it’s twice as long as a LandCruiser, so don’t expect it to behave the same way. On the beach it cruised along the firm sand as well as expected, and even when the ground got softer it held its own. Once on the beach, I was never concerned I’d get bogged or stuck somewhere (although those concerns did cross my mind before I drove on). Gravel proved to be a non-event for the motorhome – it just drove over it like it wasn’t there. Ruts and deep potholes do slow it down, though – and not because it can’t handle them, it’s just because the motorhome is so tall there’s a lot of rocking and rolling through them. One little side-note for those intending on doing a lot of off-roading in something like this; you’ll have to get a set of valve extenders for the tyre valves. It’s not that easy to get at standard ones, and even harder to get a compressor onto them. You’ll also probably want to organise an Anderson plug connection for your compressor; fitting alligator clips to the battery is hard work. It’s not in the engine bay, but under two floor panels in front of the passenger seat. You have to undo eight screws to get to it. The motorhome is handy at camp, though, and very comfortable. To the front, the drivers and passenger seats swivel into the dinette table so four can eat around it. Cleverly, the table has two sections so it extends out to a point that everyone can sit comfortably around it. There are also two USB points underneath it; a convenient place for them. The two fixed dinette seats have seatbelts, so the camper can transport four people. 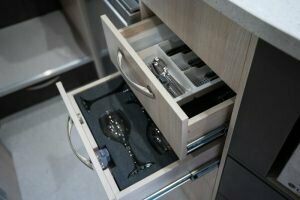 The kitchen is simple and eschews many of the current trends in RV kitchens. For starters, there’s only a small, 108-litre compressor driven fridge fitted to this motorhome and a combination sink and stove unit. There’s also no range hood, grill or oven. It’s not a bad thing, though. 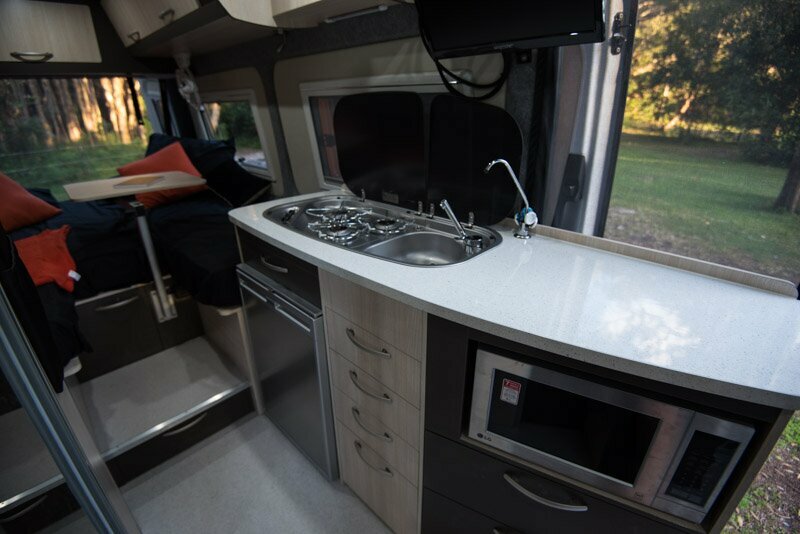 The short fridge means it doesn’t take up bench space, the combination stove and sink allows for some and instead of a range hood, there’s an extraction fan on the roof, which can also help cool the motorhome down if it’s hot inside. Storage through the kitchen is good, too. Under the bench, all the cabinets are drawers, so everything is easy to get into, even the low-down ones. Everything has a place, and foam cut-outs for the pots, pans, plates, mugs, glasses and wine glasses keep everything from rattling or breaking when on or off the road. There’s no obvious pantry, but the overhead cupboards above the dinette, or one of the two wardrobes will likely suffice. 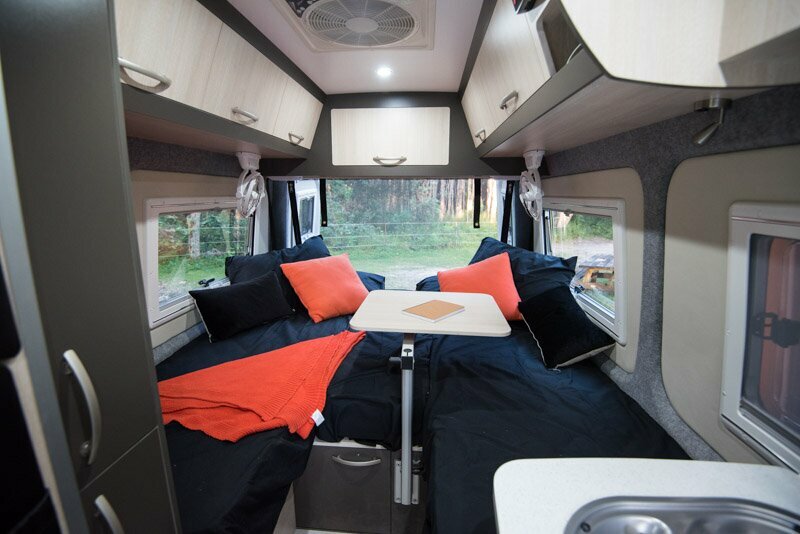 At the rear there are three bed options – twin singles (north-south), a double (east-west) or the day bed, which is fitted to Clayton’s bright orange beast. It’s arguably the best (why else would the owner of the company choose it? ), as it offers a bit of versatility. There are four reading lights around it, as well as four overhead cupboards for storage. 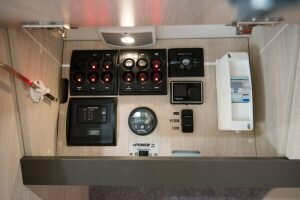 A fifth cabinet hides the electronics’ control panel, which offers switches for all the camper’s amenities and gauges to keep track of everything. 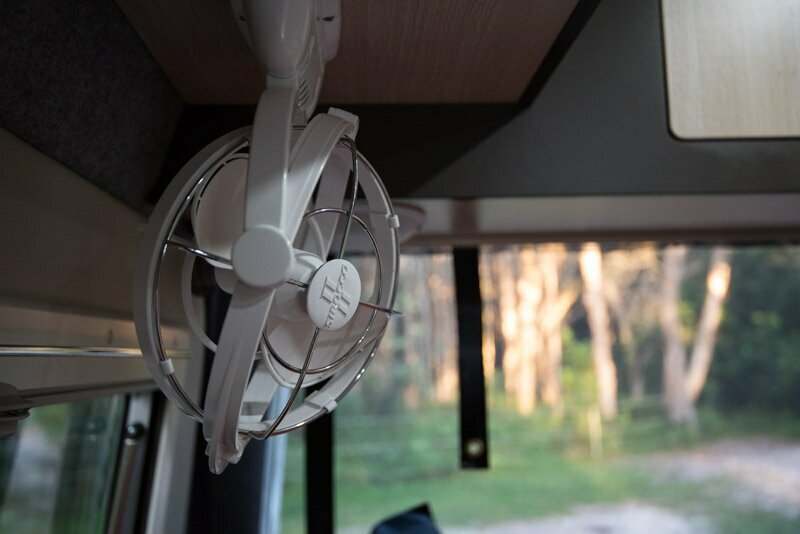 Under the beds is the camper’s most extensive storage area, which is long enough to store a 6’1” surfboard in a travel bag, as wells as camp chairs, portable solar panels and any other large camping gear you’ll need on the road. 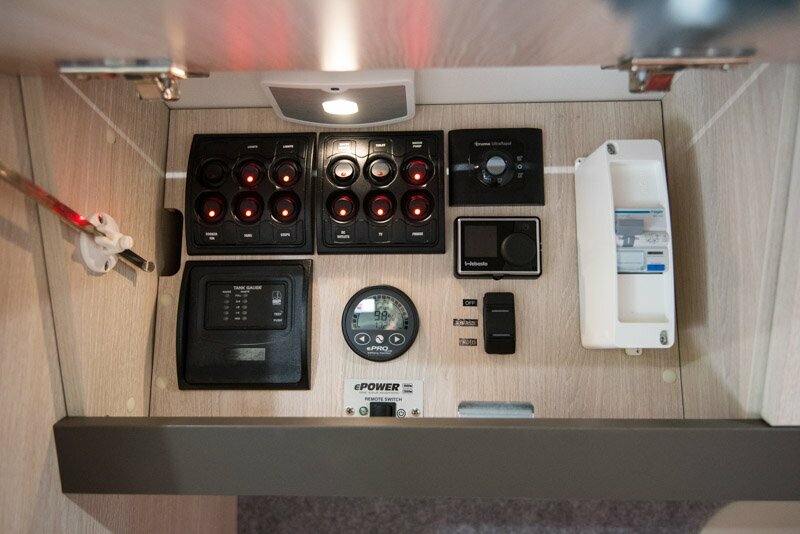 There is even access to the space from inside the motorhome, either by lifting the bed bases or through the small cupboard door under the bed. 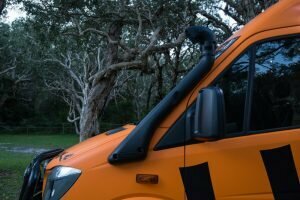 The camper’s ensuite is not that large, but it’s got everything, including stainless steel fittings, gas hot water and a cassette toilet with 19 litres of capacity. There’s even an odour extraction fan, to help keep things pleasant in the small living space of a campervan. 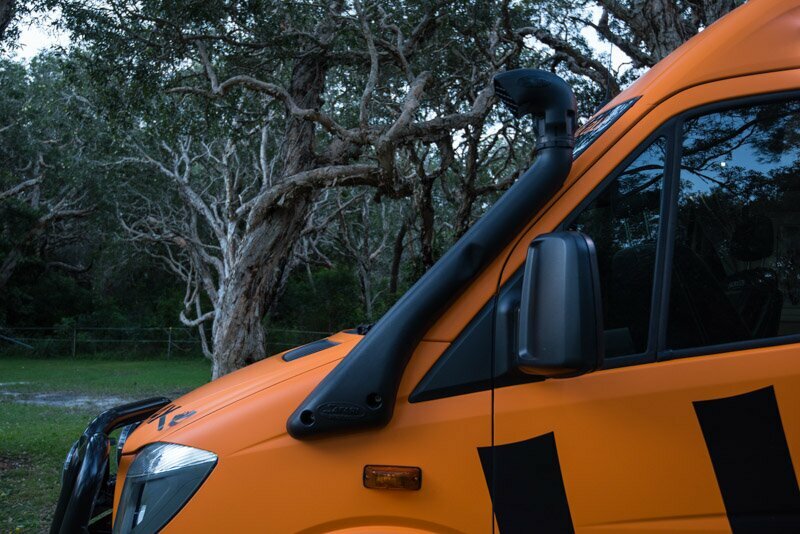 The shower is fed from the camper’s 100-litre water tank and drains into a 95-litre grey water tank, ensuring the home is completely self-contained. This camper’s had quite a few extras added to it as well. Inside it’s been thoroughly tricked up with kangaroo leather upholstery, inner spring mattresses, diesel heating, two Sirocco fans and a Fiamma Turbo-Vent roof hatch. 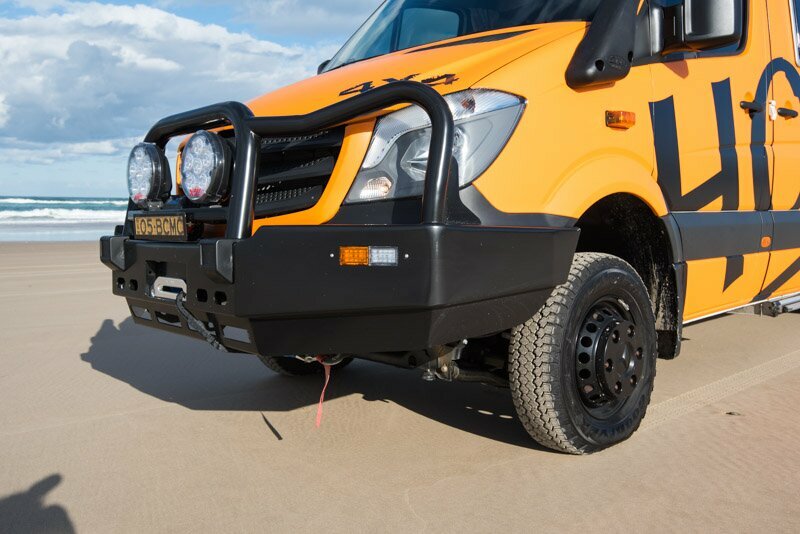 Outside there’s a bull bar with a 9500-pound winch and two LED driving lights, a reversing camera, snorkel, all-terrain tyres and two solar panels on the roof. Instead of AGM batteries, this one has 200ah worth of lithium batteries, a 2000W inverter and best of all, fly screens on the sliding and rear doors. It’s also got a few Mercedes-Benz options, including the electric sliding door, the two-tonne towing kit and floor mats, to help keep the sand out. 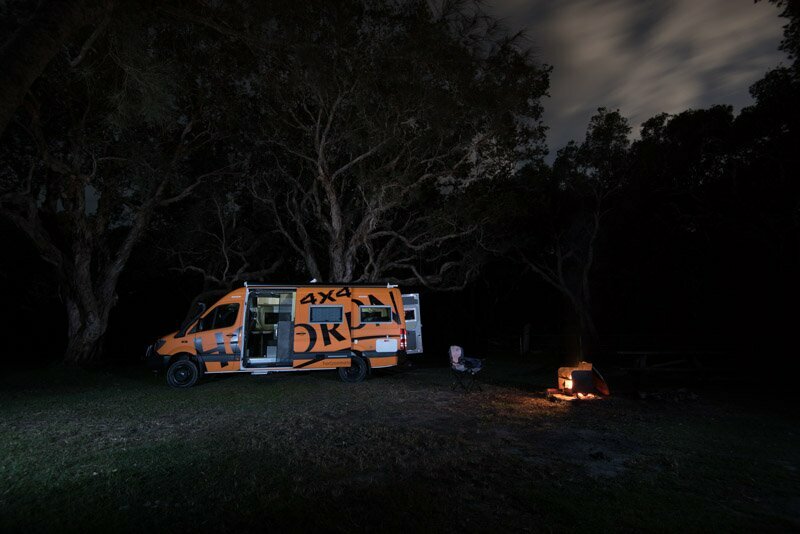 Oh, and it’s bright orange, but that’s just so you remember who built it (interestingly, I found people wouldn’t wave at me on the road, instead they just gaped at it, open mouthed, as I drove past). All up, this is one really impressive motorhome. 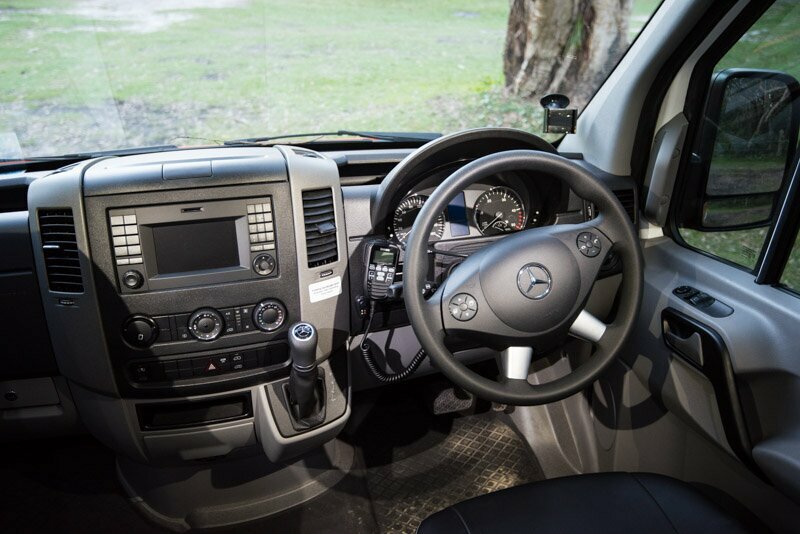 It’s comfortable, can go just about anywhere, has every modern convenience and drives very well on any road. If you are seriously considering an extended lap of Australia into every possible corner, this is a pretty bright option for it. From $176,000 drive away, NSW. As tested, $215,600 drive away, NSW.